Brussels sprouts have recently joined the ranks of “trendy” vegetables alongside kale, chard, and farro. However, while (until recently) hardly anyone had even heard of kale and barely knew farro was edible, Brussels sprouts have been a staple in American homes, alongside meatloaf and casseroles, for eons. Older generations tell frightening tales of the bitter miniature cabbage heads that kept them captive at the dinner table until there was nothing left on their plates (or they fed the rest to the dog). I was lucky enough to never have been subjected to such torture (thanks mom and dad!). I was, however, forced to try all sorts of new age stuff like eel and fried crickets (no thanks, dad). Instead, the Brussels sprouts of my childhood were the purple pieces of lettuce found in spring salad mixes. Not too sure why I hated them so, as purple was my favorite color and I failed multiple blind taste tests with other types of lettuce, but I’d leave behind a neat little pile of purple lettuce on every plate. Unfortunately, the dog wasn't a fan either. Because I was never force fed Brussels sprouts, I wasn't nearly as frightened as my grandmother expected when she introduced me to her new-school take on those old-school veggies. She even had to stop me from eating too many, and in typical Jewish relative fashion, explained the side effects of overloading on fiber. I’ll leave the rest of that conversation to your imagination. I was pretty impressed when Grandma threw these little suckers together. Though she’s an amazing cook (my personal Julia Childs) she’s famous for her more traditional recipes like Caesar dressing (I’ll never tell!) and lentil stew (drooling at the thought). When I made her recipe on my own, I added brown sugar to help the sprouts really caramelize. These Brussels sprouts are hassle free and will send your taste buds into shock when you realize that the fearsome specimens can actually taste...good! By coating the sprouts in a combination of balsamic vinegar, brown sugar, and olive oil and baking at a high temp, the outside leaves crisp up and become sweet and acidic. Pair that with the sea salt and you’ll almost forget you’re eating something healthy! The results are tender in the middle, crunchy on the outside half-sprouts (you'll cut them in half so they cook more quickly) that taste like smoky, caramely, bites of heaven. 2. 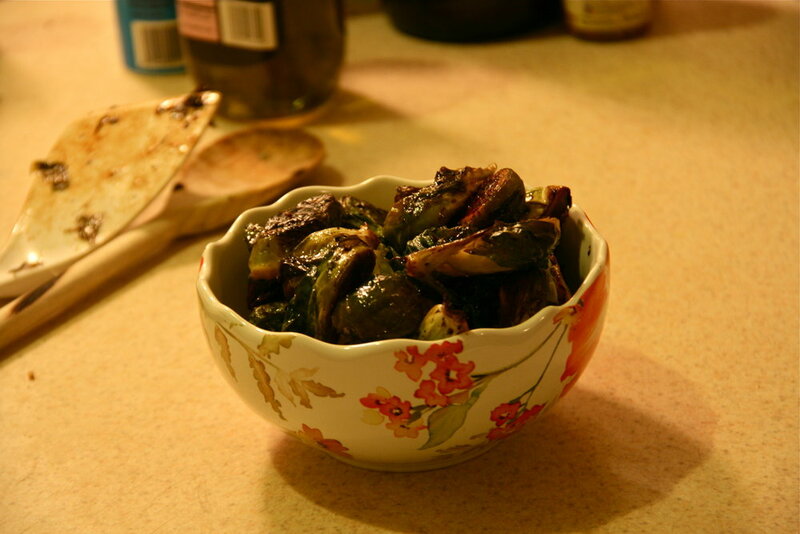 Place halved sprouts in a mixing bowl, add olive oil, balsamic, and brown sugar. Toss to coat. 3. Arrange Brussels sprouts on a cookie sheet and sprinkle with sea salt. 4. Bake for 25-30 minutes, flipping sprouts after 15 minutes. 5. 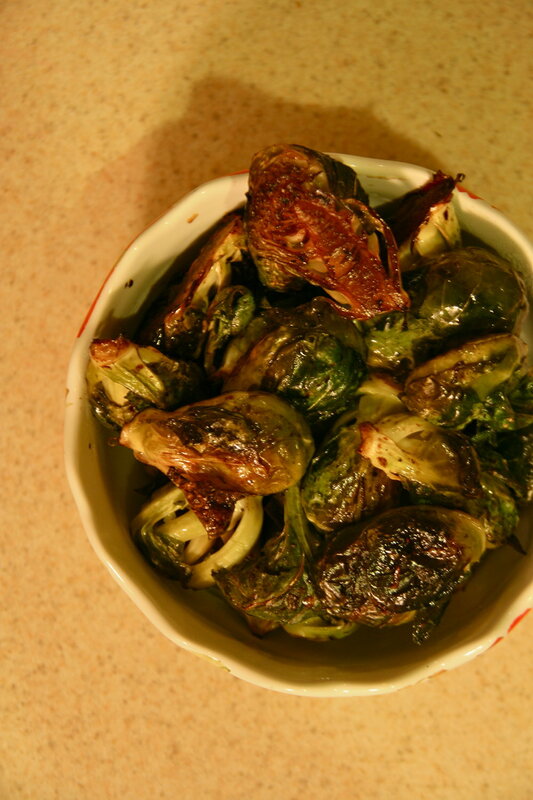 Once the outsides of the sprouts are caramelized and sticky and the inside is soft, remove from oven and serve.